BlackBerry launched today the BlackBerry Z10 smartphone running on the re-designed, re-engineered and re-invented BlackBerry 10 platform in Australia. The Z10 features a 1.5GHz dual core processor with 2GB of RAM and 16GB of internal storage with support for memory card expansion. It also has the latest enhancement in high density pixel and screen technology that allows the device to display clear, sharp and vivid images. The Z10 also comes equipped with a micro HDMI out port for presentations, and advanced sensors such NFC (near field communications) to support mobile payments and the exchange of information with a tap of the smartphone. But more than the hardware, the BlackBerry Z10 sports the latest BlackBerry 10 mobile operating system. The company claims that they have made the OS robust and reliable as well as smooth and responsive. The OS has a modern design and an intuitive gesture-based interface. It was designed to support, learn and adapt to the way you work and share and includes a number of features. For starters, there’s the BlackBerry Hub which aggregates a user’s conversations whether personal or work email, BBM messages and social media updates in a single place which can be accessed with just a swipe away. There’s also BlackBerry Flow which enables the phone’s features and apps to seamlessly flow together helping users to complete a task at hand effortlessly and efficiently. 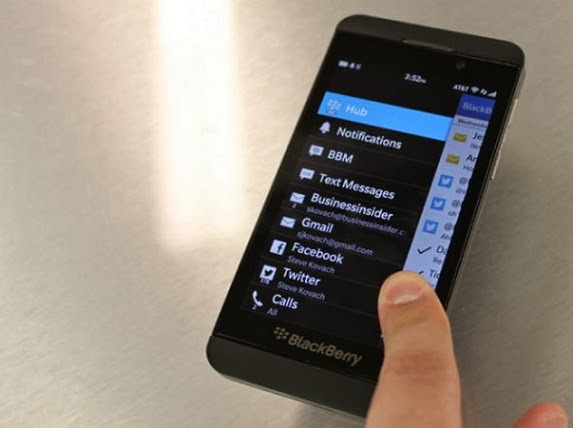 BlackBerry has also revamped the keyboard to make the typing experience more efficient and intuitive. In terms of camera and creativity, the Z10 will also have the Time Shift camera feature that lets you capture a group shot where everyone is smiling and with their eyes wide open. There’s also a Story Maker which allows users to bring a collection of photos and videos together, along with music and effects, to produce an HD movie that they can instantly share. The newest BB phones come with several apps and features that increase connectivity and productivity. Of course, there’s BBM, which includes voice calling and video chat and introduces the ability to share the phone’s screen with another BB10 contact. Blackberry Remember on the other hand is a nifty feature that combines memos, tasks and notes into a single experience. It helps users organise and manage information they have in their smartphone around projects and ideas. It also lets users collect content from websites, emails, documents and other files and lets them create tasks, assign due dates and track them at the same time. The Z10 also has built-in support for Microsoft Exchange ActiveSync that ensures safe access and management of work email, applications and data through BlackBerry’s secure enterprise mobility management features. The new OS also features an improved browser with support for HTML5. The browser includes several advanced features, including multiple tabs, a reader mode and full platform integration. Lastly, the Z10 will also feature the BlackBerry World storefront which now includes 70,000 OS 10 apps and a robust music and video catalogue. BlackBerry 10 will be available through retailers including Harvey Norman, JB Hi-Fi and Fone Zone. It can also be purchased with competitive pricing plans from carrier partners Optus and Telstra from March 25 and 26 respectively. The Z10 will be offered in either black and white, with the white one to be first offered on Telstra with 0$ upfront on the $49.95 plan for 24 months or on $60 Every Day connect plan with a $7 handset repayment per month.